Immediately following the "LEED 2009: Lift Off" presentation was one from the Green Buildings Certification Institute (GBCI) titled: "GBCI: Accreditation, Certification, and More." If the previous presentation was big on fluff and light on details, this one had me scrambling to keep up at my keyboard! Luckily, they posted a page that is uncommonly clear in listing dates for changes to occur! Beth Holst, the Vice President Credentialing at GBCI, succinctly laid out the broad strokes of a completely revised, three-tiered accreditation system that I think is an enormously good idea! Before she started she did mention that 'legacy' LEED APs don't need to worry... "nothing is going to change for you." This is sort of a lie, but we'll get back to that later. Omitted in the presentation but listed on the website is a requirement that to become a LEED AP you must now also have some form of "professional experience on at least one LEED project." This will frustrate some people for sure, but I feel it's a good step forward. "We're going to take our time with this through the year." This was about the only information provided about the highest credential of Fellow. Holst was very clear that they want to take their time to develop an appropriately rigorous standard for fellowship, and that was about all we heard about this. From a brief description, there is going to be a LEED AP Code of Ethics that all current AND future LEED APs will have to abide by. Most interesting about this announcement was that Holst hinted at some sort of peer enforcement system. Apparently there will be some avenue for people to tattle on their peers who aren't promoting sustainable design as they should. In the past the USGBC has essentially steered clear of policing its ranks, so it will be interesting to see how this develops in practice. Aside from the times listed below, I have it on good (but not rock solid) authority that the last day to register for the current LEED-NCv2.2 and LEED-CIv2.0 exams is going to be March 31st, with GBCI to cutoff administering exams sometime around June. This should give you plenty of time to study, take, and pass the current exams should you so choose, but you don't have much time to wait! "What do legacy LEED APs have to do? Nothing..." was what Holst said, but this ain't exactly true. With the new exams will come a new credentialing maintenance program. That's right, it's just another word for continuing education requirements... BLEH! Details are a little fuzzy, but the program works in two year blocks that will be consistent with the two year LEED revision cycle. In addition to the fact that you have to do the continuing ed, you must also now pay a bi-annual maintenance fee of $50. Current LEED AP's will get the first FREE for first 2 years but will have to pay thereafter. There's more to this than listed here, but I just wanted to hit on the high notes. Visit the GBCI page about the new system for more details. What do you think about the changes? Please let us know by leaving a comment. I listened in on this session as well. I think the new credentialing system makes a lot of sense and I do like the idea of continuing education IF it is done correctly. The one thing I think is still missing though is some for of registration number for LEED AP’s that can be linked and searched such as what exam did they receive their AP, which projects have they been affiliated with, member in good standing etc… I know it may seem overly harsh but the people who took the early exam versus the more intense current versions really are not of the same caliber if they have not worked directly on a LEED project. The Biennial requirements seem strange to me, I would rather see a yearly requirements as it keeps the accounting tidy. 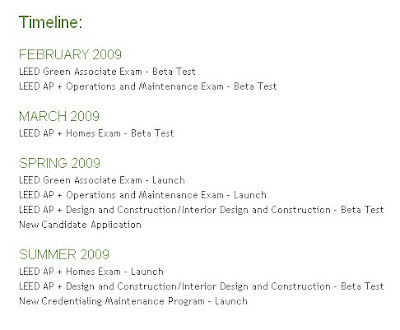 From the GBCI website for Legacy LEED AP it says under requirements that "agreeing to credential maintenance." but under Biannual CMP Requirements there is no requirement for Legacy. So is it required or not? And how much if yes? Why would they make the new Tier two level "LEED AP" which matches everyone's existing business cards. How is a customer expected to know the difference between a Legacy LEED AP and a LEED AP? I doubt GBCI can force all of their existing LEED AP's to change their business cards to add "Legacy" onto it. And can any say cash cow. I called GBCI, as I just passed the NC exam two days ago. The guy on the phone was very polite and said that I would only have to agree with the Ts&Cs of the new program and keep up with the continuing ed requirements. I am a little confused....does this mean that you have to pass a pretest to become a Green Associate first, and then take an AP exam after that, or is the Green Associate track simply an abbreviated one for non-tech people? Or both? The General Associate track is definitely for non-technical people, or those that one day aspire to the LEED AP+. The two exams can be taken together or separately. As for the CE, it should not be too difficult, especially if you are an AIA or some other designated professional, since CE hours for that can count towards most of the LEED AP credential maintenance. I think there will be several options available, and a list of continuing education providers approved through the USGBC's Education Provider Program listed at http://www.greenbuild365.org. Q: How are the exams going to be different from the current process? A: Tier 1, the LEED Green Associate exam is a computer based, multiple-choice examination; you will have 2.5 hours to complete it. This core exam is also part one of the LEED AP+ examination. If you become eligible to take the LEED AP+ exam and you have maintained your LEED Green Associate Credential, you will not have to take the Core exam again. Tier 2, the LEED AP+ exams will be two parts. The exams are multiple choice and computer based. The first part will be the “core” knowledge exam (taken by Tier 1, LEED Green Associates) about green building and general knowledge about the LEED rating system process. The second part will be a specialty exam depending on the track you choose. You will have 4 hours to complete the examinations. to GreenGeorge's point, has the GBCI confirmed exactly how they will be dealing with Legacy LEED AP's how "opt-in" to the system? From what i could tell, which may be completely off base, Legacy LEED AP's will need to opt in, pay fees, and re-take a test. I have no problem with the fees or learning credit requirements of the new structure, but i don't want to study for and take another test that i've already passed. On the other hand, i don't want to lose my LEED AP (whatever level it may become) either. Does anyone know for sure what the approach for Legacy LEED AP will be under the new system? Like it but...The continuing education thing would be good if they require a test for everything...too many people...yeah that was me next to you...sleep through "courses" at things like AIA conventions and get credit...whata sham...but a guaranteed "gimme" for those that can attend these events. Yeah...go ahead and hate me...but I believe continuing education should be just that! jgroob: The GBCI is actually pretty clear on how "Legacy" LEED APs can opt into the system. In 2009, you agree to their terms, including continuing education, and start paying the maintenance fee in 2011. You only get classified a "Legacy LEED AP" if you do NOT opt into the new system. Once you've joined the new system, you are a LEED AP+ in the specialty track related to the exam you originally took, as GreenGeorge described. If you are currently a LEED AP, you are NOT required to retake the test to opt into the new system. For example, I took the LEED-NC exam in 2006. Next year, as soon as I can, I'll opt in to the new system, agree to their protocol, maintain 30 hours of continuing ed every two years and start paying the fee every two years, starting in 2011. For that, I'll be considered a LEED AP+ in the BD+C specialty track (as the 2009 counterpart to NC), which, for the moment, really only relates to the content of the 6 LEED-specific hours required of the 30 hours total every two years. The only instance in which a current LEED AP would retake an exam would be to prove their knowledge in an additional specialty area, for me this would include anything except BD+C. If I wanted to be a LEED AP+ in the Homes specialty track, I would have to take the Homes specialty exam. The GBCI also pointed out in their presentation at Greenbuild that they are looking for every opportunity to double-dip for the continuing ed requirements - possibilities include credit for working on projects, attending other professional courses, etc. I think the confusion about Legacy LEED AP's who opt in and if they'll need to take a test comes from this statement on GBCI's website. Q: What if I want to get an additional designation? A: If you are a current LEED AP, have agreed to the disciplinary policy and credentialing maintenance, you will only have to take the specialty portion of the exam. The question talks about an additional designation. But the answer doesn't seem to talk about an additional designation. Reading that I think they're talking about any designation, first included. If GBCI said very clearly that all Legacy LEED AP's who opt in will get the specialty track associated with the test they took I'd feel better. NC test would equal BD&C. EB test would equal O&M. CI test would equal ID&C. Something like that would make me feel a little cheerier. What do you foresee the requirement being to prove you have LEED project experience? Obviously they can see if you are registered in the system if you are officially on a LEED project, but what about other LEED AP's (in the same company) who may assist their colleagues (perhaps in different offices) with design strategies and the like? Just to clarify. I'm speaking about Legacy LEED AP's here? I'd like to understand more about how classifications are used. I’ve got a few questions. If a Legacy Leed AP had certification in Existing Building . He/she subsequently finds a client with a Commercial Interior project involving an Existing Building does this mean that he/she cannot take on the client? If a builder, who is a legacy AP in New Constructions has an existing homeowner who wants him to renovate a property that potentially the builder himself built prior to becoming a Legacy NC. Does this mean that he can’t take on the project for certification? If a builder does not become a Legacy AP before the deadline does this mean that he is not going to be ineligible for ANY AP certification because he doesn’t have any Leeds projects to work on and can’t certify any because he can’t become AP Home Certified? Is he expected to hire someone else to certify his projects? The USGBC should win a lifetime achievement award for branding and marketing. The fact that they've successfully convinced the public, and it seems a lot of the professional industry as well, that being green is equated with having a LEED certified project or being LEED AP says more about LEED as a money maker for the USGBC (and affiliates) than it does as the institution for positive environmental change for which it supposedly exists. You can have green project, and many times more so, if it's not LEED, but the USGBC doesn't want anyone else figuring that out. I just completed two of the greenest residential projects in the country...without LEED. We were involved in the beginning (and would have been LEED Platinum), but after getting into the process, our houses were becoming less green. We fell into the trap that most people do on a LEED project; point mongering. Taking elements out that were truly beneficial and adding non-sensical elements for points became a counter-productive, and counterintuitive, to what our goals were for the projects in the first place. If someone thinks spending $9000+ to hang a plaque on your houses makes them more green than using that money to better insulate, get more energy efficient appliances, or add 2 extra solar panels to your PV system (which is what we did), then your heads and hearts are in the wrong place. The Earth doesn't give a crap about your plaque, but it does about the amount coal is being burned to heat and cool your LEED home. Instead of everyone running around wondering if this is LEED or he or she is LEED AP, they should be asking themselves what these projects, and people, are really doing for and to the environment. I know of so many LEED certified projects that are a complete joke in terms of energy efficiency and their actual benefit to the environment, but because of the USGBC's brilliant branding, the layman on the street thinks it's the greenest thing out there. Being LEED AP or having a LEED project has become so sheik that people lose sight of the point of the program itself and act like LEED is the new Prada or Gucci of the construction world. Its become blingy and not by accident. This sycophantic blind devotion to LEED and it's bumbling counterintuitive design by committee policies has to stop. You should be building green and learning to be better stewards of the environment because there is a real need to do so and you have a sincere desire to better the environment. Instead you're all worried about what you'll be able to put on your business cards and how often you'll be able to pat yourselves on the back at social gatherings for being environmentally mediocre. Wanna really make a difference? Adopt the 2030 challenge and cut your projects' energy consumption by 50%. That will do more than any shoe rack or recycled countertop ever could. I agree that LEED does not equal 'Green'. USGBC is very money oriented and great at selling their LEED brand. The reason we're all jumping over each other for LEED points is because that's what building owners, our customers, are asking for. It's an uphill battle trying to disuade someone from what they want. If we don't meet our customers needs then they find another A/E firm that will. Every A/E firm can claim environmentalism and building owners want some form of independant verification of these firms' claims. Because of USGBC's branding, LEED has become the defacto standard everyone builds to. LEED is also the first thing clients see on my business card. I've struggled with LEED's rational on credits. Some don't make any sense. Some too easy while others are nearly impossible. So I try to improve this standard by making the public comments on new versions. Let's just say I'm getting frustrated with being ignored by the review board. And I think others also feel frustration. I think USGBC is still riding on its wave of marketing. Getting building owners to compare actual energy use may make building owners ask what value their LEED plaque really has when they're using more energy then their neighbor's building. Public opinion is the best way to improve energy efficieny. And public opinion is squarely on the side of LEED right now. Maybe if one of these other less known green building standards rose up there might be some competition between the two for who has the better performing buildings. Good to have this thread as I parse GBCI's requirements for LEED AP legacies. As for the requirement that LEED APs actually work on a green project in some capacity-- I understand why this is desirable and reasonable, but there is a real estate slump out there and projects-- green or otherwise-- are hard to come by. This requirement favors employees of larger firms and people located in more progressive real estate markets. The requirement makes things a lot harder for the employees of smaller firms who are locatd in markets where green projects are few and far between.